← Is China’s Debt Crackdown Hitting California’s Commercial Real Estate Bubble? 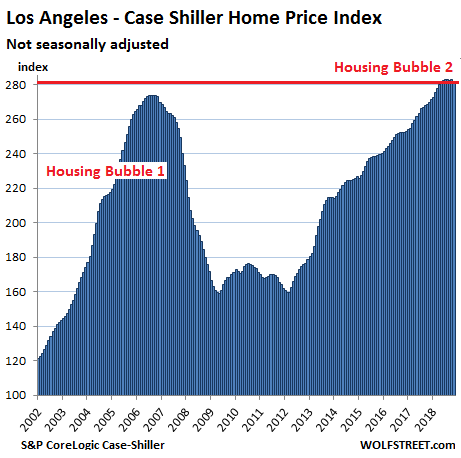 Wolf, Is housing bubble 2 caused entirely by ZIRP or are there other factors at play? Bernanke himself explained that QE was designed to inflate asset prices, particularly house prices and stock prices. That was the only purpose of QE. Bernanke also said that using bonds for settlement would “sterilize” any inflation. Now China has their own (reserve) balance sheet rolloff, which portends problems for the US monetizing debt. Congressional attention to fiscal probity may surprise some, they really have no choice so they argue about a 5B wall while the shutdown cost 11B to the economy, which alas is not part of the revenue in their budget. 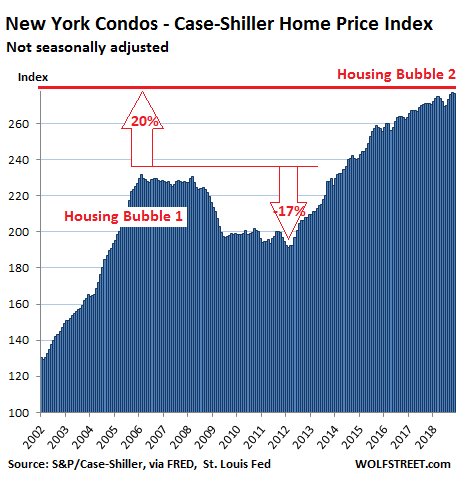 ZIRP is only one toll they used to reinflate the housing market. FHA loans at 3% down and VA loans at 0% down are another. There are other programs available to borrow the down on conventional loans. Lending to borrowers with low FICO scores and stated income ‘liar’ loans are also back again. The majority of mortgage lending is now done by the lightly regulated shadow banks. They pulled out all the stops to prevent housing from returning to affordable prices without a lifetime of debt servitude. History may not exactly repeat itself, but it certainly rhymes. 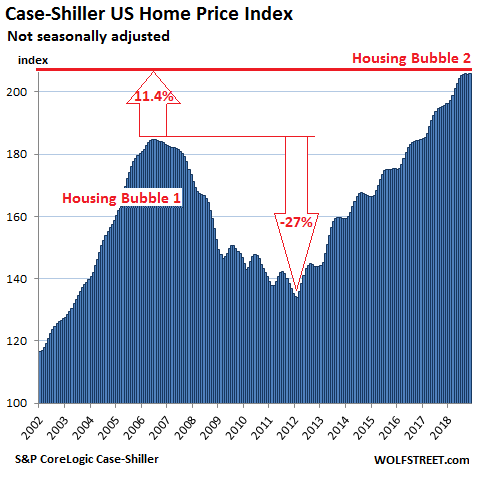 Unfortunately, the Case-Shiller only tracks 20 housing markets in the US. This does not include hotpots like Nashville, or even the huge market of Houston, which is a story of its own. I live in this area. Price increases have varied widely through the Chicago metro area for the past 10 years. Chicago is only 2.5 million people. But if you include the 7 counties surrounding it, its 10 million people. Kane and Will County, were the fastest growing counties in the country, prior to Crash 1. Now they are no where near their peak prices. People can’t give away their homes. Other mature cities, like Naperville, that have top notch schools, did great city planning, home prices maintained a steady increase since ’08, and are higher now than pre crash, but didn’t dip that much to begin with. 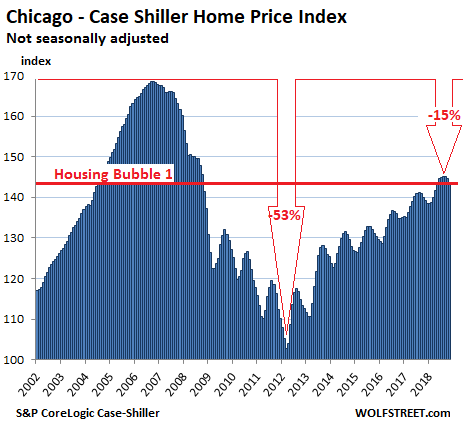 So if you live in certain areas around Chicago, and the wrong area, if you bought your house 20 years ago, you might not be breaking even today. And many of these were $750,000 homes, in very nice subdivisions, but perhaps further outlying. Go into Chicago proper close to the loop, and there are a lot of revamped neighborhoods, where prices have gone through the roof. They are heavily sought after by the younger gens, and many are rentals, where they are paying very stiff premiums. Those are going to collapse in the next crash, and its when the massive layoffs occur with firms like Google, Facebook, Linked-In, Uber, Apple, Salesforce, and many of these other firms who added these other cities to their list of offices. Firms like Linked-In and SalesForce are such an over priced bag of worthless crap, those stocks are bound to lose 90%. 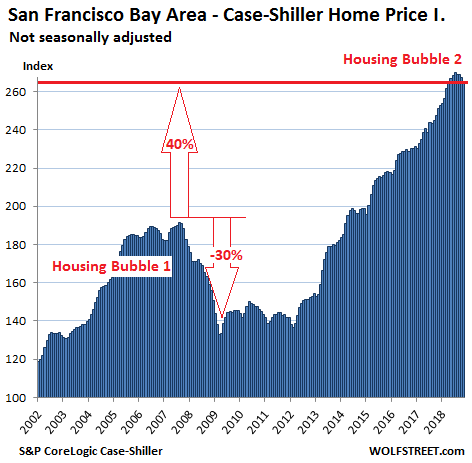 When that happens, and it will, just like many of the dotcoms, you’ll see housing prices crater in many cities that you never imagined. The entire Nasdaq is priced this way. We have become so complacent and take it all so for granted now, that truly what these firms provide is inherently way over priced, and can be easily dispensed with. Its when a lot of these cloud based firms, totally collapse. Companies are paying for so many subscription services that are not generating any revenue whatsoever. Anyway, the real housing crash, where prices never do come back, will be when people get religion on the hoax (and really parasite) that firms like Google and Facebook and Apple, and Netflix, and even Amazon have been on the American corporate populace. If economists start predicting any kind of recession, you know it’s bad, really really bad. That of course is nonsense. Markets don’t behave like that. When the mainstream finally gets it it’s too late, as rhodium below points out. Prepare now! I agree with everything you said. These companies are so grossly overvalued, both in terms of their stock price and the amount of value they provide to a consumer. This is especially true for SAAS and many smaller software companies. They generate a lot of their revenue from other IT departments who are CURRENTLY allowed to throw money away on duplicates and triplicates of software/saas that goes unused. This is all going to change real soon. I can not wait to see everyone who is complicit in this fall on hard times. Be very nervous about the next several years if you work in tech or are reliant on a significant other who does. Also if you are a landlord in seattle. Or if you were stupid enough to purchase a condo in the seattle area the last several years. Some form of tech crash or correction will come. But the industry will recover and be as ridiculous as ever. Data science and advert money have probably gone over the top. But the next push coming from more advanced AI will drive another crazy surge in tech work and probably create new tech leaders. The big tech companies of today will become Microsoft esq, there will be a cleansing of new companies and probably a reset of stock prices. But there is still serious innovation and money to be made on the rebound. As someone who sets up ERP systems to be compliant with GAAP and IFRS for huge companies, I can tell you that what is happening and what will happen with DATA SCIENCE and AI is remarkably unimpressive and pretty useless especially when you take the long term value into consideration. The whole mentality of the entire tech industry is standing in it’s own way. They are not innovators, they are probably the biggest impediment to actual progress. The only company I see doing anything impressive is Microsoft. It is only a matter of time until the balance of power in companies shifts from IT to Accounting and Finance. Tech has most companies in such a chokehold right now. I’de also like to point out that I expect some major issues involving the SEC and compliance coming from some of the majorly overvalued companies. I expect that to happen this year. Amazon outright lied to the SEC about their ability to measure their revenues. We will have to see if the SEC wants to cave to these companies and tell them they will not have to play by the same rules that EVERY OTHER COMPANY HAS TO COMPLY WITH. I can guarantee, this is not going to be the last time you are going to be hearing about this. Except some huge articles and books to be written about this. The shitshow is coming so brace yourself. Wolf, It would be nice to see these data start around 1996-97 (pre bubble) to get a better idea of just how large bubble 1 was. Thanks for your keen insight and hard work! Wolf, similar story in the ‘Great White North’. Canadian real estate sales fell over 11% in 2018, the biggest drop in sales since… wait for it… 2008! This while loans secured by residential real estate have reached record highs. Being led by senior’s, despite higher rates on these reverse mortgages. Other than Ottawa and Montreal, all other Canadian real estate regions have recorded a fall from peak sales. Prices definitely not dropping where I live on northern Vancouver Island. While places like Vancouver and Toronto are starting real declines, and Victoria entering a more milder decline, retirees and city refugees are still pushing up prices on the rest of the Island. When a fixer-upper is a million+ in YVR, then there is only one possible outcome. But when you can pick up something beyond luxurious for 1/2 that price, people give it a whirl, at least those who think outside the box. I have met a few new couples who bailed out of Vancouver last year, and many many more from back east. Mind you, I also spent all day working outside in a tee shirt and jeans (sandals). The tulips are up and the daffs are about 6 inches high. There are lots of reasons why prices are holding. We’re going camping in about 2 weeks. Tulips in January? They are my wife’s favorite.!! She has never been to BC and I only visited for 1 day 20 years ago. When is the best time to go? P.S. Thank you for your frequent posts. Yes, tulips are coming up already. I’m just south of Seattle and we’ve had a fairly warm winter. If your wife likes tulips you need to bring her out early April and visit the flower fields in the Skagit Valley. Housing prices don’t seem to be changing that much, but I am noticing houses staying on the market longer. There’s a place in my town I looked at, a 5 minute walk from home, that’s on the water, great views, clean, neat, etc…and where it would have sold in a week a year ago it’s now over a month on the market. It’s not the only place like that I see daily. Wolf, who bought all these houses? China people? Private Equity? Although not scientific at all, I haven’t heard a friend, relative, co-worker who bought after the last crisis (except a cheap rental for income) to participate is this asset bubble. Now, of course, ETFs and Bonds are a different story. But I have not seen Mac Mansions built around my neck of the woods in years. What does MBS issuance say to support this? I just a bit surprised. Family friend 30 y/o (Berkeley tech driverless car startup) and wife (Oakland primary school teacher) bought in Oakland 2 years ago. For $750,000 they got a 1,200 sf cottage. But hey, they can bicycle to work. The home buyers I’m aware of in Seattle are all immigrant families headed by someone working in tech, usually in their mid 30’s. Still cheaper than renting. Lol. Let me guess, they also borrowed the down payment through some type of financial alchemy? Sold my house in N NJ last June. Now I am renting a 2 bedroom Apt in Walnut Creek Area for 2600/ month. Equivalent house in Walnut Creek is 1/3 the size of one in NJ with 1/7 the amount of land. On what planet is renting more expensive than buying? Show me the numbers. My stats show renting is a relative bargain right now. I live in a 7 unit townhouse complex in San Mateo. Units are 1400 sqf, nothing special but in the ‘desirable’ part of town. In March of 2018 one unit was listed with virtually no upgrading (built in 1978) and sold the first day $280k over asking. Buyers are of Chinese descent (I am really reluctant to get into a ‘what kind of asian are you’ discussion but I wonder where all this money is coming from too, just like I wondered in 2008). Advance to October….unit is on the market for 60 days, sold to an offer of 30k over asking. Young woman and her boyfriend living there, her parents bought the place for her. The name is Chinese. So based on this e̶v̶i̶d̶e̶n̶c̶e̶ anecdote it’s still Chinese money but not so much…..
Hey Wolf, can you please write about the pension crisis and pension off-loading. I have to believe this is worrying a lot of people. Thank you. Want to hear a joke, GM is a pension company that happens to make cars. The version I’m familiar with is that it’s a finance company that happens to make cars. GM is a jobs program for otherwise unemployable unskilled middle-aged women (Mary Barra) that also happens to make cars, kind of. Excellent article! Vancouver Real Estate is getting obliterated as well… Apartment building new constructions are smooth sailing, but the sales of existing homes is starting to hit the panic button, and nothing snapped in the bonds yet! Do you think it will drop 70% by then? :-) Really, current Vancouver prices have no basis in reality. My aunts bought a home on 4th and Sasamat for $27,000 in 1970, (or thereabouts). They were holding out for $250,000 in the latter ’70s when the bottom fell out of RE, big time. (Think about it, they were shooting for almost a 1,000 % in just over a decade.) Despite the stained glass windows, hardwood floors, full basement, a rich lawyer bought it and had it torn to build a show home. (for the view). Someone else bought it not too long ago and had the ‘show home’ torn down for their version of paradise. Anyway, the sale allowed my aunt’s to buy a view home in Whiterock for cash…then they retired. My father-in-law had a place in west van…same thing. A rich lawyer bought it for the view/location and had it torn down. Father-in-law bought a larger view home (semi waterfront) in Parksville, on 1/2 acre….then he quickly retired with cash in the bank and no mortgage. This is currently happening all over BC as people leave the over-priced ‘ship’ Vancouver in droves. It has to have a big effect on prices. The Chinese have slowed down their activities. The city is a traffic gridlock nightmare, and no one can afford to live there. How much longer can these prices stay in the stratosphere? 2020 is only a year away. I find it hard to imagine the decline will be limited to a few %. Therefore, I find it also hard to accept 2020 will be the bottom. From the outside looking in a 50% drop would be reasonable. 2020 is believable if the correction has a hard enough push, the timeline would match the previous timeline in the US, late 2007-early 2008 things started to slow and by mid 2009 they found bottom in some big markets. Some took until 2012, but I think with the governments both foreign and domestic trying to slow the insane asset price growth it could make this downturn drop pretty harsh and quick in GTA and GVA. Everywhere else has had an “agonizing melt” for the last few years, except GTA and GVA. I think if you pair the CAD and the housing market charts, the places that grew while the dollar collapsed with the oil bust will be the ones to watch. What does it mean for Canadian bank stocks? I own some. Might be too early and KTFK. Maybe in 2022 or 2023, because the everything bubble will need some time to correct. Looks like the FED will start propping up assets again…umm I don’t know, by summer these minuscule drops in prices and sales will be gone, and housing will be even higher. Given the strong economy and low unemployment, all it takes is dropping mortgage rates and credit scores standards to prop up housing again. The fed can’t restart QE, it would destroy the dollar. I’d be out of housing as an investment if they did, might not keep up with the inflation that would likely generate. Maybe gold, foriegn stocks or stocks in commodities? The Federal Housing Finance Agency (FHFA) today announced the maximum conforming loan limits for mortgages to be acquired by Fannie Mae and Freddie Mac in 2019. In most of the U.S., the 2019 maximum conforming loan limit for one-unit properties will be $484,350. So who is financing these houses? Maybe CASH purchases. But looks like money is coming from somewhere. But most young families cannot even afford the down payment. I don’t want to spoil your argument, but countries like Spain and Italy have the lowest mortgage rates they have ever had. Rates now are actually lower than they were in 2006 at the top of the bubble. Spain has even resurrected the infamous 100+% and no money down mortgages. Yet Spain is seriously struggling to maintain the 30,000 mortgage approvals per month which are deemed absolutely vital by the banking, construction and real estate industry. In Italy the mismatch between asking prices and supply is at an all-time high: there’s too much construction going on in a slowly depopulating country already filled with houses for sale and for rent. These new expensive and horrible houses will be an albatross tied to the neck of local banks for years to come. All the ECB shenanigans have managed to do was inflating another mini-bubble which can pop at any minute: all it takes is not some catastrophic crisis but for a few more people to realize they are being handed a rotten deal. Rates may be record low, but prices are sky high especially when stocks are considered and when the time comes to sell the legion of buyers the real estate industry promised to hopefuls simply fail to materialize. Spain depopulating, you mentioned. Would that be foreigners (like Brits) returning home or are citizens actually packing it in and moving away? Depopulation is chiefly caused by two factors: emigration and lack of replacements. Emigration can be split in two parts: Spanish natives leaving for better employment (think all the nurses working in hospitals and clinics throughout Europe) and “oriundos”, meaning people of Spanish heritage (chiefly from Latin America) who get fast-tracked for citizenship and leave as soon as they get an EU passport. There was a boom in the latter between 2003 and 2010. Now they are leaving. Lack of replacement is due to the fact immigration + births < emigration + deaths. Now, on top of this one has to consider internal migration: cities like Alicante are booming, but small towns and villages in the interior are emptying. Regarding foreigners… all the people I know who live in Spain don't do so full-time, usually leaving in the Summer due to both hot weather and the mass of humanity descending on Spain in that period. I have considered Spain as a new base of operation due to certain fiscal advantages but to be honest real estate prices are hard to swallow. If I wanted to throw money out of the window for a new HQ I'd move to Hong Kong or Zurich. That’s the financial bubblevision MSM story. 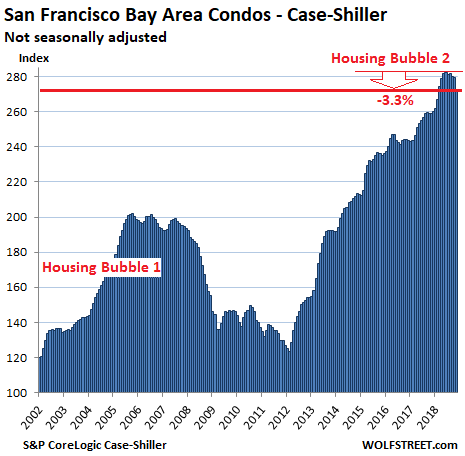 It’s not likely that housing will escape the bursting of the everything bubble. China is deleveraging and it will continue to do so..
Did you notice that the Chinese govt stopped deleveraging and started stimulating again last year? China and East Asia was crashing all last year. Govt. money is not going to prop up chinese investors in American real estate and it won’t help many in China either…. BTW, A sign of the negative stock market is a temporary rise in real estate prices. “Investors” sell stock at a loss, driving down the market, then think they’re so smart and put the money into real estate. Then *that* bubble bursts. Maybe this has already happened…! What started to somewhat lose steam in 2018 was caused “The Everything Bubble” precisely because every asset class across the board went up in unison, except perhaps precious metals and commodities. “Smart money” is already heavily invested in the US real estate market, so much even the Fed has been fretting about their exposure to shaky sectors such as commercial real estate. This is not so much because there is some sort of catastrophic Lehman-like event but because problems swept under the rug for many years have started to become too large to ignore: to stay in the groove, once highly profitable malls have been put in a very tight spot by online sales (after adding overcapacity for over a decade) and there’s a serious affordability crisis in many housing markets, meaning there’s a serious mismatch between what developers think they’ll get and what people are able/willing to pay. Check out how many homes they have in each location. Staggering. Competition for ordinary home buyers. Arcadia, CA was once the epitome of Chinese money flooding into America and bidding up properties for investment. Not so much anymore. I’ve been watching the inventory of > $2 million dollar homes grow and sit unsold on the market for months. Some of these McMansions that were bought in 2014- 2016 are now listing just a little above what they sold for back then, but not selling. In fact, of the homes that actually sell, some are transacting at prices below what they paid in 2014 to 2015. It looks as though most sellers do not need to sell and can afford to keep their homes on the market for months and even years, so prices won’t collapse, but if more shocks to the Chinese economy occur and people need to re-patriot their money, prices may accelerate to the downside. It is amazing that so many think the Fed is omnipotent. Example: buy dips soon because new Fed QE is coming. The Fed controls monetary policy and cannot indefinitely make up for disastrous fiscal policy a.k.a overspending with borrowed money. The Fed has a long memory and remembers the near collapse of the US$ in 1978 when the US could not borrow in dollars and had to issue bonds denominated in Swiss francs ( Carter bonds) It is not anxious to preside over a sequel. Some seem to think a mere five years will see the see the fall from peak to trough, which is where you should buy. But these cycles occur within larger cycles with a wave length longer than 10 or 15 years. One of these begins with the US leaving the gold standard in 1973. When Reagan took office the debt of the US accumulated since 1776, was one trillion dollars. Four years later it was two trillion. The Fed could theoretically inject another shot of paper adrenaline but like the hormone, the injection leaves the patient weaker. All we can hope for is the slow decline of asset prices: the soft landing. However likely this is, it becomes more unlikely if the Fed succumbs to pressure for ‘just one more hit’. Ah, the allure of the soft landing. That however isn’t how markets behave. The central banksters may be able to soften the fall a bit, but not stop it. It is amazing that so many think… that the same fundamentals apply today as they did 10 or 40 years ago. Fundamentals always apply, that’s why they are fundamental. Of course the Fed can keep assets inflated in nominal terms, if it is willing to trash the US dollar. Any real asset in Venezuela is way inflated in terms of the local currency. The US is an empire approaching bankruptcy. All those nukes are of no more help than they are for Russia, which is closer to bankruptcy but has a down trodden population used to hardship. The belief that the Fed can create or preserve REAL wealth is at its core a religious belief. 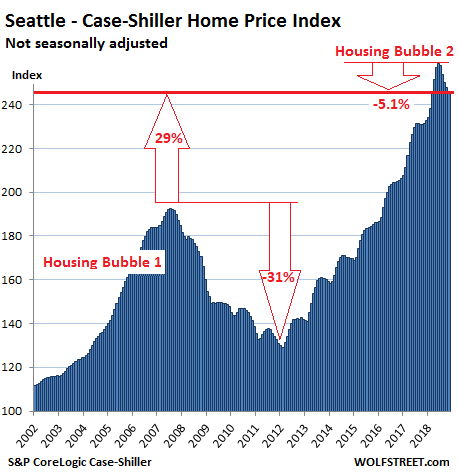 Since this is the second massive housing bubble, much larger than the first, I wonder how many people will decide to simply pick up and move, and sell their house while they can ? These are generational peaks, that will likely never be seen again in many of these heavily overbought markets. Then if and when these people bolt, do they create mini-bubbles in new markets, where the house prices have been more stable, but critical things like schools, shopping, low crime, etc have stayed in the upper rankings ? If you cash out, you have to move somewhere. And a lot of the warmer climates are also heavily bought, and/or have very poor schools, inadequate infrastructure, or just simply worse weather than some of these mega bubble markets do. there is no more QE to reflate more bubbles. its done. If lots of people flow to underdeveloped areas and start businesses etc, the counties get tax revvenue for better schools etc. I’ve heard about people moving away from the metro areas. 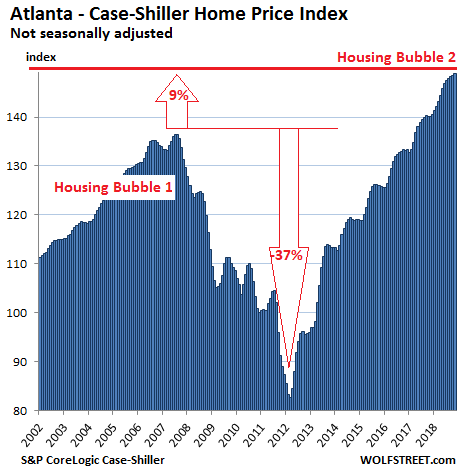 Wolf always said real estate bubble coming. Does anybody feel anything happening around? I don’t see anything in greater Los Angeles area. 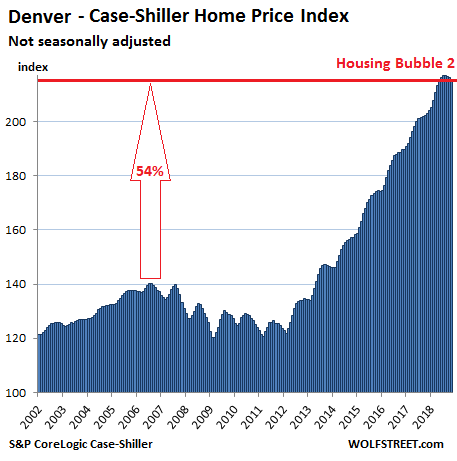 Housing Bubble 2.0, it was nice knowing ya. You’re just an innocent victim of all those Yellen and Bernanke Bux being sent to money heaven by that evil Jay Powell. I get sentimental thinking of the heady days of your youth when 3% interest, 3% down mortgages were flowing like wine. You rescued the American economy from the calamity of cheap housing and financial sanity. R.I.P. in peace. In coastal LA/OC, I do not see a problem. I see slower sales, but why is that a problem? Any decent deal goes into escrow rapidly. The economy is just too strong. I do see rental prices rapidly rising. Seems as if all the real estate crash stories is causing rents to jump because people are scared to buy after reading the negative press. People have to live somewhere. Brought to you by NAR. Now is the best time to buy!!! Slowing sales is the first symptom before falling and then crashing prices, so not good. I keep hearing the religious preaching about how strong the economy is but since the send of September my economy has fallen off a cliff. I’ve been in and out of recession since Q3 2014 so it must be nice having all those $250K+ jobs guaranteed for life but I certainly wouldn’t know. Bear in mind if one is in their early 30’s there’s theoretically a chance you’ve never seen a down turn……..I’ve seen plenty and the verbiage that i’m reading here ALWAYS ends up meaning one is right around the corner. 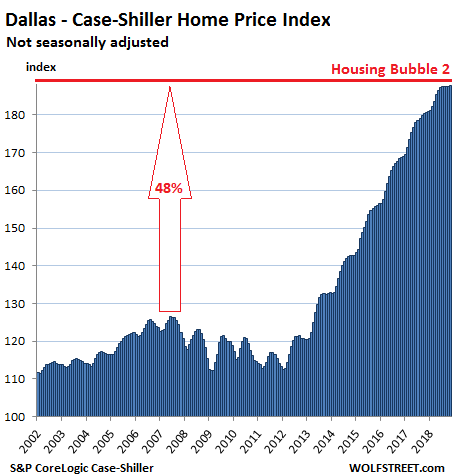 Real Estate in Dallas is much better than shown but is definitely changing. Still red hot for me because I read Wolf and actually follow his advice. Listed 1 house 2 Friday’s ago and 1 last Friday. Both entry level. First time home buyer level.. Built in 50s-60s, but max updated because today’s buyers watch HGTV and don’t want to settle (or put in sweat equity). Running comps I see the disconnect Wolf mentions between Buyers and Sellers. Sellers getting ever greedier and Buyers starting to pull back. Days on Market going up, and price cuts and “Seller Contrbutions” happening often. But if you price it FAIRLY and have a good product people are still desperate to buy in droves. 4 offers in 3 days on 1st house, all at or above list price. 10 offers in 4 days on 2nd house, 8 at or above asking. 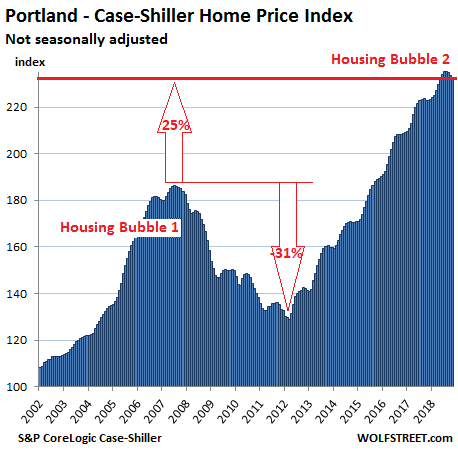 Yes, the times are changing, but not castrophically and really just reverting to a RATIONAL housing market where you have to do a good job, work harder than the competition, pay attention to details and not be greedy. You’ll always sell quickly if a product is good quality, is competitively priced, and the market isn’t in a panic. That’s just you being rational. The market fundamentally acts with herd mentality. It’s rational until it’s not. Thanks for the update. Yes, this is the case even in the once hottest markets that have now turned: properties that are priced right (where the buyers are) sell quickly. Properties with “aspirational” prices sit. And too many sellers are having trouble coming off their aspirations. It’s the brokers’ job to infuse a sense or reality into sellers, but it’ll take a while. Chris, your comments reflect what I’ve seen lately in the DFW area. The teardown frenzy in the Park Cities vicinity is still going strong, but it does seem like properties are staying on the market a bit longer than they were a few months ago – though this is just my eyeball observation. Asking prices in the Bluffview / Devonshire area are still insane. Sellers are definitely still greedy! My folks sold their zero-property line home in Arlington, Texas– a suburb of Fort Worth occupying the concrete between the former and Dallas– in early October. 1800 sq. ft, first (show) home in neighborhood bought for $117K in 1995. In good shape but needed updating and sold “as-is.” Having to relocate quickly to the Northeast to be closer to their kids (my mom and I packed up over one weekend while my Alzeimer’s-suffering father stayed with my brothers in CT), they were tickled pink to get $205K for it after being listed for just a few days. I definitely had the impression that they got out just in the nick of time given the complexity of trying to sell a home from 1,700 miles away. They even sold their farm truck to the neighbor at a semi-steep discount. 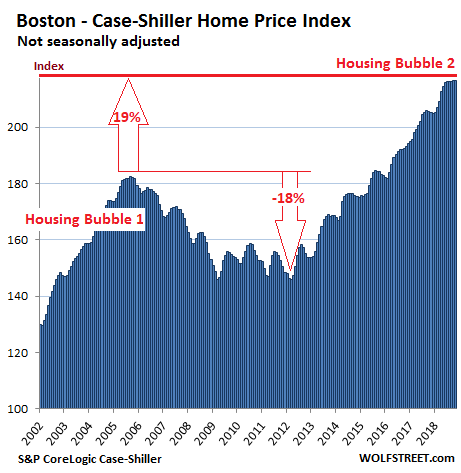 Here in Boston area burbs my limited knowledge matches the Boston housing graph. I sold my ocean front condo almost 3 yrs ago because it’s gonna be under water someday and I’d like my heirs to inherit something of value. Now I own a split level ranch which siuts my (now older) lifestyle just fine. The internet says my former and present property have increased in value some since buying/selling and nearby sales seem to support that. Our family built our house 41 years ago and I haven’t cared one whit what it is “priced” at, up and/or down, over the years. What mattered then and matters now are things like stable socio-politics here and all the house’s entrances are on grade – no steps. What’s your point? Do you think everybody can do that? How many people have the same employer and/or can stay in the same city for 41+ years? My wife and I have lived in Santa Clara, Ca for 42 years and in the same house for the last 41 years. I’ve had 5 different employers all within a 6 mile radius of our house during that time. Although I congratulate you on your stability I think this is a massive exception. The TV shows that promote “renovation” are an insight into wild spending habits. My dump which my wife and I still likes was a Frank Lloyd Wright pre-prarie effort. There are several from the Chicago suburbs and up the lake. A gentleman from the University of Chicago drove into my Main Street neighborhood where there is a 1920’s prairie style house across the street. He knocked on the door and we let him in to go through his reasons that Wright did the house as an independent commission when barred from doing that according to his contractual employment obligation. The flow in the 120 year old house is better than any of the same age. The Prairie style house across the street is pleasant to see from the outside, but terribly bad on the inside. We must tear down these domiciles to make room for the unbelievably ugly modern houses. This unwinding does not appear to be happening outside Seattle. The area I’m monitoring is about 20 miles South. Prices seem to have stayed put – but not gone down. Hoping it is just a delay. The spike seemed in the area seemed to be about 6 months-1 year behind. The margins are not being pressed to hard yet because the job market is still good. Housing price changes are sloooooowwwww. Hard to imagine someone calling for a big drop in house prices when the job market posts another hot number. Certainly, I do not think it is possible. How can someone rationalize such a dichotomy? Wasn’t the job market hot at the top of the last housing bubble? Interest rates. Excessive valuations. End of buyer panic. Can the author try showing some inflation adjusted metrics. Some back of the envelope metrics gets you to having the current highpoint being about 80% of what we are showing here. Toss in the fact that we went years without stagnate housing stock (little construction, shuttered houses) and a growing population base. Some areas might have problems, but this isnt a national crisis. As I said, these indices ARE measures of inflation, namely of house-price inflation. The indices show the price increase of the same house (since it is based on sales pairs). In other words, it shows how much the dollar has lost in purchasing power vis-à-vis the same house over time. This is a graph with standard CPI applied. The peak is lower than 2006. Housing supply is still low. Employment is ridiculously good (lagging indicator). “Some areas might have problems, but this isnt a national crisis.” – Yet. Watch what happens if we get a recession against this over-leveraged market. Just watched Powell’s press conference. I don’t know how it can be interpreted as anything but retreat – full capitulation and accommodation to Wall Street gambling casino. 1). Interest rate is primary monetary tool, and it is on hold. 2). Balance sheet normalization level is “recently” judged to be far higher than it was previously judged. 3). He made a point to say more QE is on the table as a tool the help the economy in the future – not just cutting interest rates. Jay Powell obeys mister market. Now we know for certain. 1). Fed believes normal balance sheet is “far larger than before” the 2008 financial crisis. Wall Street has a b*i*t*c*h boy. They are thinking that QE artificially inflates asset prices and all the bad things that causes such as penalizing actual capital and savers, causing inequality, distorts the legitimate role real capital plays….to a name a few. Ok got it…but didn’t you think the Fed thinks a collapse is just around the corner? If they do they aren’t indicating that they think so.